Many people live with chronic conditions that are preventable. Often, these conditions continue while the symptoms are treated by traditional health care. However, in recent years, dangerous side effects have become a major concern. By some accounts, hundreds of thousands die each year in the United States due to medical error and adverse side effects. Upper Cervical Doctors understand that the world’s greatest “drug store” is within your own body. Your body knows how much insulin to secrete, antihistamine to produce, cholesterol to make—provided that we have 100% brain-to-body communication. As experts on the upper cervical spine, our chiropractic doctors focus on the intimate relationship between the top two bones in the neck, called the upper cervical spine, and, more importantly, a vital portion of the nervous system called the brain stem. This relationship is absolutely essential to the body’s ability to restore and preserve health. 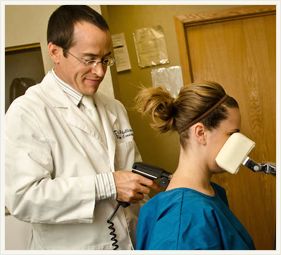 Upper cervical doctors use precise and objective spinographs or X-rays of the head and neck. Then, measurements are taken and an analysis is made to determine exactly how the top vertebrae are misaligned. Part of upper cervical's uniqueness is that it is the only healing profession that clears the nervous system of interference and balances the body using a natural, precise and gentle procedure, without twisting or jerking the spine.